Our manifesto is making waves! Read all about the impact of our affordable workspace actions. Manifesto Anniversary 25th March, 7pm to 8.30pm Clapton Girls Academy. Food & drink provided by members. 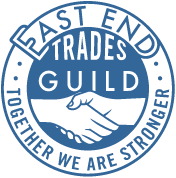 January News: East End Trades Guild Named As One Of The Country’s Top 100 Changemakers + LOTS MORE! NOVEMBER NEWS: CROWDFUNDING- WE DID IT! PLUS, UPCOMING EVENTS..
70% FUNDED AND 13 DAYS TO GO! THANKS TO ALL WHO’VE JOINED THUS FAR! WE’RE CROWDFUNDING, GET ONBOARD TO BE ON THE MAP! Summer News: Guardians of the Arches win a meeting with Minister of State for Transport + so much more! Victory for our Affordable Workspace Manifesto so far!